Ever since we moved to a new flat, I have noticed that our meals at weekends have been tastier. I definitely think it has something to do with living near the local greengrocer and butcher - potatoes covered in mud are definitely better than the ones washed and prepared at the supermarket. Apparently there's a reason for this - something about the potatoes losing some of their starch in the stuff they wash them with - but I do wonder whether it's just 'cos it makes you feel like you're cooking in a country farmhouse. Anyway, I was moaning away to George the other day about not being able to go to the greengrocer during the week because of work, and he had this BRILLIANT idea. I swear it was all him and absolutely nothing at all to do with me. He even managed to get hold of the other half's bank card to punch in the numbers with his hooves. Amazing. So, now every two weeks on a Friday, I get home to find a box waiting outside the door to our flat, full of lovely organic local veg - it's like Christmas for me every two weeks. Yes, George signed us up to a veg box scheme from Riverford Farms - www.riverford.co.uk - and we get a medium box every two weeks. I chose the 'seasonal' option, which means you don't get potatoes and onions (and these keep if I buy them at the weekend anyway) but you get whatever is seasonal and local. It's brilliant and I love it, even if my Mum will ask me when I got to be so middle class. My only problem is with what you do with stuff you don't know how to cook. 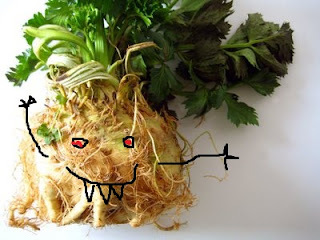 It might just be me, but I swear a celeriac looks like one of those cartoon monsters you get in mobile phone games. Not that I play at breeding monsters on the train to work in the morning. Not at all (George mimes coughing fit). But as the other half had paid for the priviledge of getting seasonal veg delivered to our door, I braced myself just in case it grew fangs and jumped at me, and went for it. 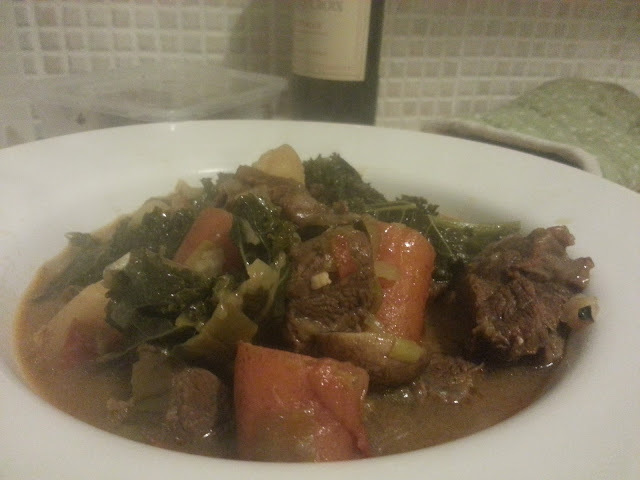 The result was this stew, which was most enjoyable and very easy to cook. The celeriac gives it a much lighter feel than potatoes as do the leeks rather than onions, and the kale gives a lovely fresh bite at the end. I also don't use flour to thicken my sauces which helps if you're wanting something not quite as heavy as a big winter stew. 2. When the leeks have softened, add a little cumin and cayenne pepper before some diced stewing lamb. 3. When the lamb has browned, add 4 or 5 carrots and 1 celeriac, chopped to around the same sizes as the lamb chunks. 4. Stir the mixture for a minute before adding a tin of tomatoes and enough water to cover the meat and veg in the pot. Season generously - celeriac is like potato with salt - it slurps up loads of it. 5. Bring to the boil before putting in the oven at around 180c for 1 hour 30 minutes. 6. Add a big bunch of chopped curly kale before popping back into the oven for another 20 minutes. You could serve this with crusty bread for the non-gluten-free people to soak up all the juices - but because I'd just spend my whole meal staring at it, I didn't, so we stuck our noses in and snuffled the broth up out of the bowl instead. Everyone keeps going on about how lovely celeriac is. I tried it recently and HATED it. But then I don't like cooked celery either. I am doing cauliflower 'rice' next. Wish me luck. When did you get to be so middle class?